The year-end performance report is out and the results are remarkable! 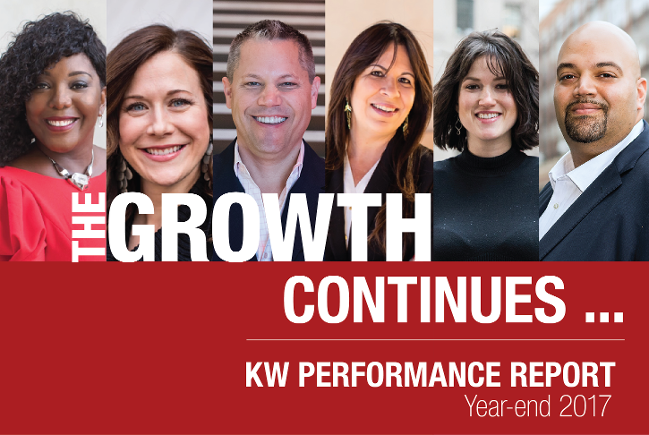 Our agents’ relentless focus on growth has pushed Keller Williams past industry giants to become the number one real estate franchise in the United States in agent count, closed units and closed sales volume. KW agents aren’t just outperforming the market, they are making HISTORY. In Q4 ’17, they once again broke production, owner profit and profit share records set in Q4 ’16. Agents closed 250,815 transactions in Q4, up 9.0 percent over Q4’16. Agents closed $73.2 billion in sales volume, up 13.0 percent over previous Q4. Franchise owner profit in the fourth quarter was up 7.0 percent over Q4’16 to $39.9 million. Profit Share increased 10.0 percent over Q4 2016 to $34.9 million. Agents took 140,013 new listings (new market inventory). Listings taken volume totaled $42.7 billion. Agents wrote 257,750 contracts (projected to close in 60 days). Contracts written volume is $75.0 billion. You are disrupting the industry and the proof is in the numbers! Share your value and gain even MORE market share with the KW Performance Report. Customizable PowerPoint Template: Impress at your next listing presentation. Customizable Press Release: Leverage news outlets and gain market share. Social Media Collection: Share your performance with your sphere. ¹ Keller Williams is industry leader based on global agent count and U.S. closed volume and sales units. The data was compiled by Keller Williams Realty, Inc., from company websites, SEC filings, industry reports and other publicly available sources. ² Franchise results achieved across the United States.